Hello, third trimester! To formally welcome the third trimester, today's post will be all about the comfy pants, a.k.a joggers. 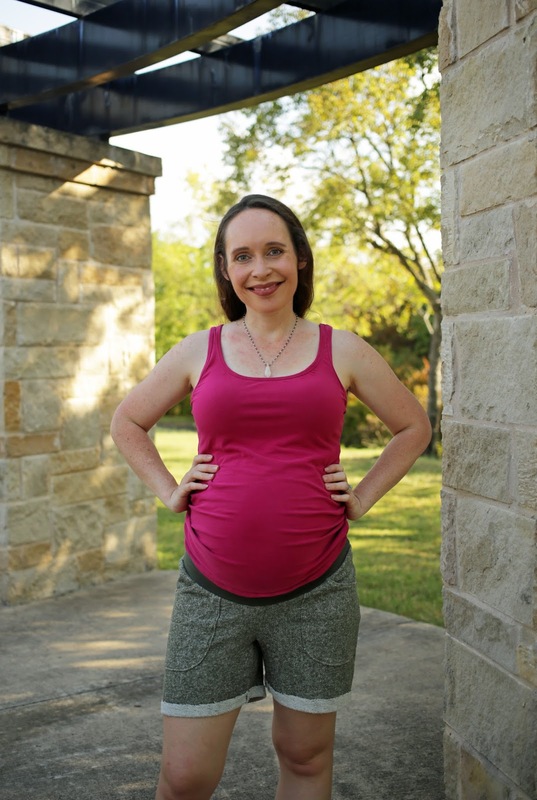 Over the past several months of blogging for maternity, I think my most used word is comfortable. 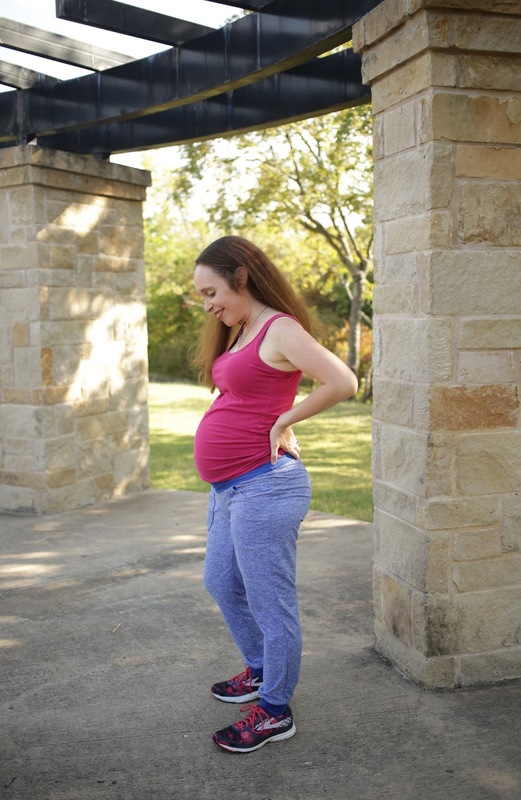 My key to dressing for maternity is comfort, and it is always an added bonus if I look put together at the same time. I love to look good while feeling like I am wearing pajamas, and I am so happy that jogging pants are in style! 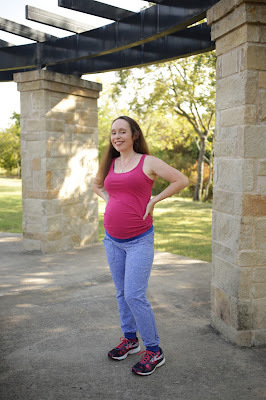 I am really excited to share with you today about 5 out of 4 patterns newest release, the Diane joggers, and how wonderful they are for maternity. 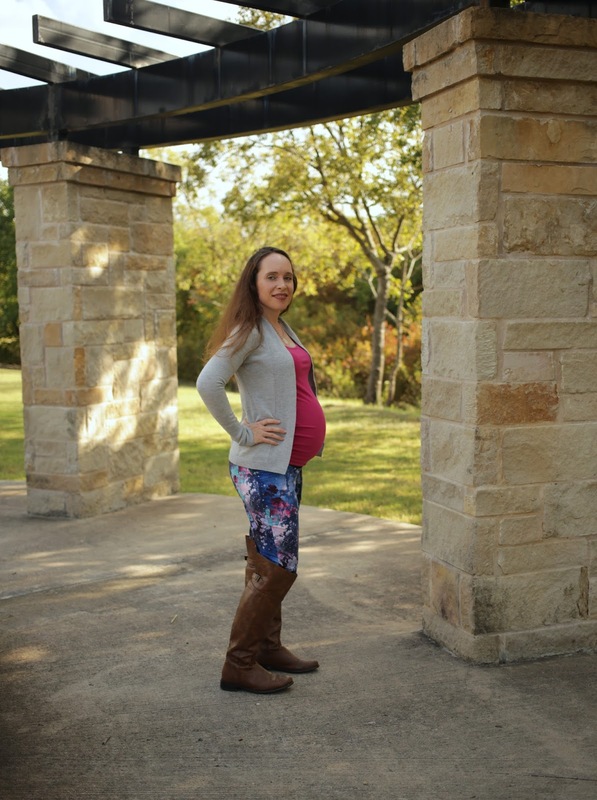 I tested their low rise/maternity option, and I couldn't be more happy with how well this pattern fits and the options it includes! To begin the test, I made a pair of shorts in a size Small. My hips measure 38 inches now, which puts me in between the XS and Small. 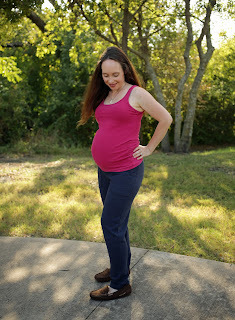 The small will give me more wiggle room if my hips expand anymore in this final stretch of pregnancy. I made a pair of shorts first to check crotch fit on me and see if I needed adjustments before making pants. Making a muslin is very important to check fit, and I loved all the detailed help in this pattern to get the perfect, wedgie-free fit for everyone. The only adjustment I noticed that I needed after my first pair was to go down to the XS in my legs when making pants. My leg measurements fit right into the XS size chart anyways so this adjustment made sense. I also turned the hem up so that I could see the pretty contrast of the wrong side. Fabric choice: I used a French terry remnant that I found at Super Textiles in the fabric district. The owner Steve is such a wonderful guy, and I always enjoy getting to visit him and all of his beautiful fabric. I used cotton lycra from Made Whimsy for the waistband on this pair. One of the great features of the Diane joggers pattern is that it has a back yoke that does wonderful things for the bum area! Next, I made a pants version that may be the most comfortable pair of pants I own. I need Texas to bring some cooler weather just so that I can wear them all the time! These are the full pants version of the Diane joggers that are hemmed and do not have cuffs. I used a navy cotton sweatshirt fleece that I got from Aimee Wilson. She made a pair of jogging pants last winter out of it that she loved and shared her left over fabric with me. What a treat! I used a coordinating cotton lycra from Made Whimsy for the waistband. This pattern is great for knits without vertical stretch. This means, however, that the rise will turn out higher in the back if you are using a knit with a lot of vertical stretch. I have a 27 inch inseam so I needed to shorten this pattern. There is one lengthen/shorten line, but I knew that it may not be as smooth if I took so much out in just one spot. So, I took out 1-1.5 inches at a time in 3 different spots, for a total of 3.75 inches of length removed. The first line I made to take out length was in the thigh, the second was at the actual lengthen/shorten line, and the third was about 4 inches below that. 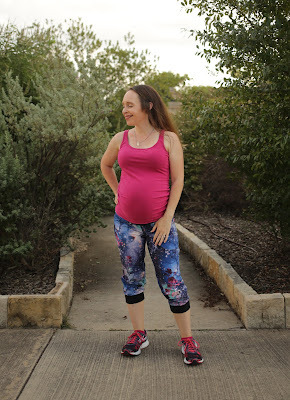 For my next pair of Diane Joggers, I wanted a pair that would work for the gym since I try to stay active throughout my pregnancy. 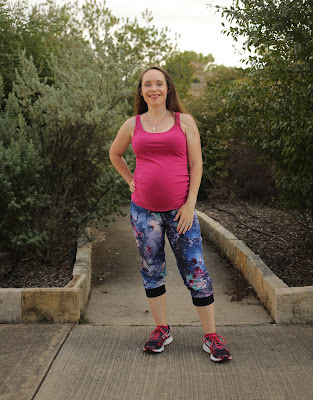 I used some athletic brushed poly from Zenith and Quasar that is so soft and works great for joggers. The pockets on this pattern are patch pockets and are very deep. I can fit my entire IPhone 6 in them, and it is completely covered and not falling out. Total win! 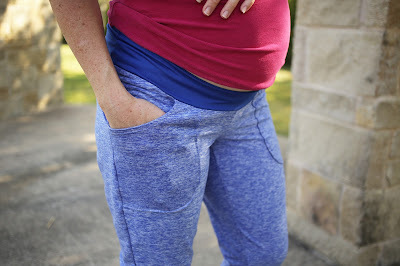 I have yet to find store-bought clothes for women with functional pockets! My final pair of joggers were in the capri length. This pair was made from Zenith and Quasar's plush brushed poly. This fabric is so incredibly soft. Capri length is one of my favorite because I get so much use out of them Fall through Spring. There are so many winter days that are not quite cold enough for pants where I live. Here is one of my favorite way to wear them, though, when we do have an actual cold day - with a sweater and fleece lined boots. The only alteration I have made to this pattern since the testing period is to change the patch pockets to a pocket bag. Yes, that is right, I am already making another pair of joggers since taking these photos! Thanks for reading my blog! 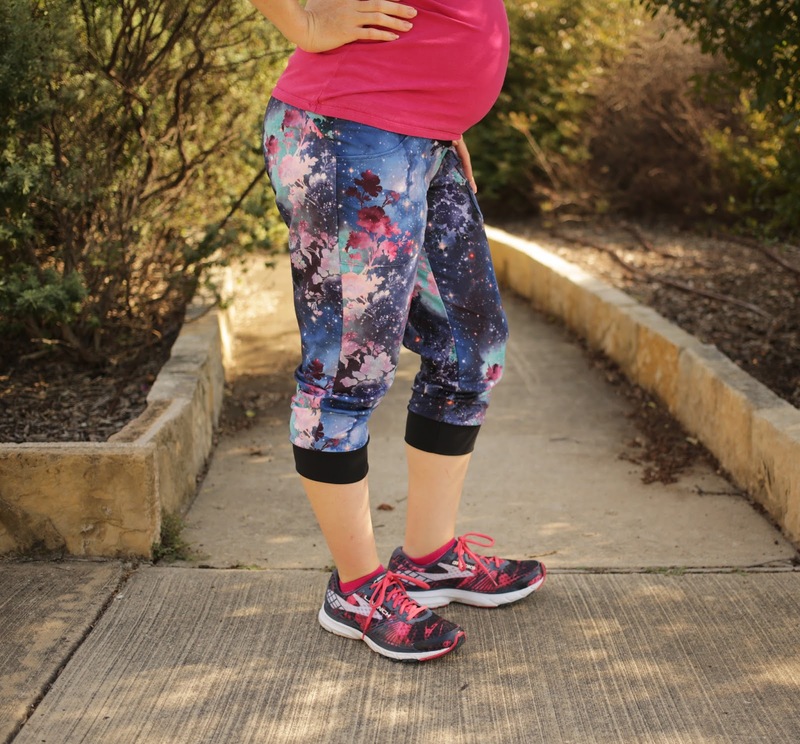 You can grab your pattern for the Diane Joggers here.